We have finally managed to decide on what work we need (and can afford) to do to the house. We have chosen a builder to rebuild our en suite to the main bedroom, which has some rotten beams supporting it. That should start ext month. We are also waiting for a quote for fitting a bath in the current shower room. The bad news is that when our electrician was fitting a couple of new lights, he found a problem with the earthing of the whole system, not immediately dangerous but should be sorted out. It should have been spotted by the firm which did an electrical survey for the buyers pack – so I have asked the estate agent we used to contact them to sort it out, but he doesn’t hold out much hope of them admitting responsibility. In the “garden” at the back of the house we are now planning to install some decking to give us a decent sized flat space, and a large poly tunnel to enable us to grow our own veg secure from birds, squirrels, deer etc. With some sunnier weather we have been getting out a bit more. Last week Judy went to a church service about n hour away in the Dordogne, and after we had lunch with a friend we met when we stayed in that area for our first month out here. 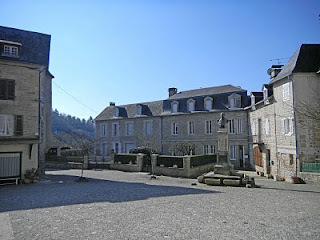 There is also an evangelical group which meets much closer near Pompadour, and Judy and I were invited to lunch for Judy to decided is she would like to attend some of their meetings. Really nice people, and the husband is ex RAF aircrew – so we have a few friends in common. We still hanker after a few items we can’t get easily out here, so a couple of weeks ago we met up with the travelling fish and chip van in a local town. It stops outside a small bar – you order and pay for your food, go in and get a drink and the food is brought to you – quite a fusion of civilisations! A few other Brits there – something we may do a few times a year. The other item we have missed is bacon, although there is a wonderful range of hams and pork products. A small farm near Pompadour is owned by an English farmer and his wife, and they produce their own bacon and sausages, as well as beef and lamb. Last night’s bacon baguette was very enjoyable! We are getting to know our way around the local area, and many of the local towns and villages. 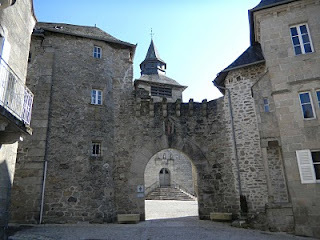 A few days ago we revisited the village of Correze (on the river Correze, in the Correze department), and realised that we had missed all the good bits on our first visit – it has a very pretty centre. Driving through the countryside on a sunny day is a joy, although watching a car still covered in snow pass us was a worry as we couldn’t see any snow even in the high hills to the east, we guessed he must have come a long way. My business is almost ready to be launched. I have had a website created, which I am very pleased with, and which will come on line as soon as it has been translated and the French pages added.